As the saying goes…he who be-ith attacked by one-eyed monsters shalt cast the first stone (or something like that right). Today marks the launch of Pebble Universe, the brain child and inaugural title from the Swedish duo, Itatake. 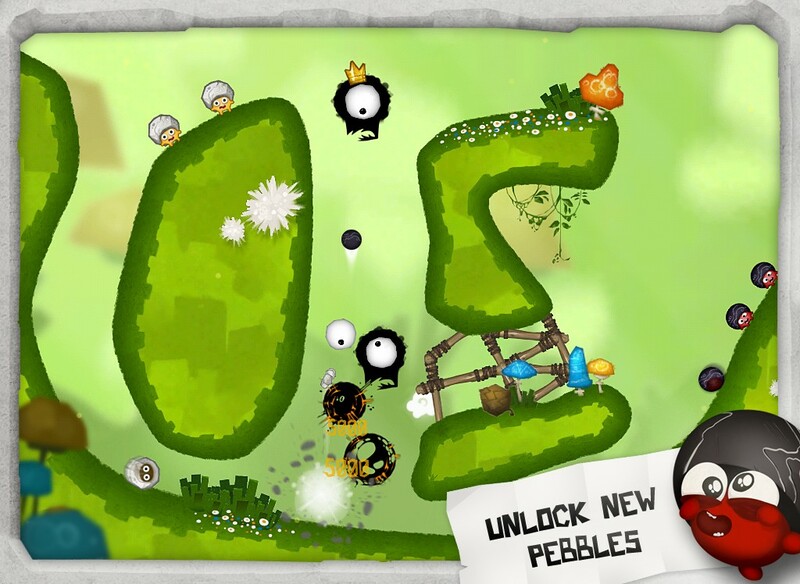 It is a physics-based puzzle game set in a world where adorable peace-loving pebbles are threatened by evil soot-black one-eyed monsters. You see, these dark creatures love Pebble-meat more than anything, and want to devour these cute little bits of stone. Unfortunately for the pebbles, the cyclopic baddies can see through the Pebbles’ stone camouflage, forcing them to go on the offensive to survive, quite literally putting their heads together in a fight for their lives. In each of the game’s 50 standard levels, players must set one or more pebbles in motion, such that they collide one another, releasing stone shards into the air that will strike and kill the one eyed monsters, you never fire the pebbles at the monsters directly. A level ends either once you’ve killed all of the one-eyed monsters, killed all the “royal” monsters, or run out of pebbles (in which case you lose). You earn a special ribbon for eliminating all of the monsters in a given level and another trophy for reaching a certain per-level point score. There are also five bonus flower levels which are unlocked by finding and collecting a special flower which appears in five of the standard levels. In this bonus fare, your goal is to time the launch of your pebble such that you intersect all three of the large floating flowers. The Normal Pebble – “This guy is Mr Allround, the most common pebble in Pebble Universe“. Big Pebble – “Greater size and a heavy body makes this champ a good wingman to the normal Pebble”. Sniper Pebble – “Great range and high precision makes the Sniper Pebble perfect everywhere it is possible to take a clean shot”. Splitter Pebble – “The splitter is the perfect weapon anytime you are in close-quarters with tight low ceilings, like in a cave”. Cluster Pebble – “He is hot, and he will explode. Learn how to control him and you will find big use for him”. More than anything Pebble Universe is a test of timing. Figuring out exactly when and from where to launch your pebbles is the key to success. 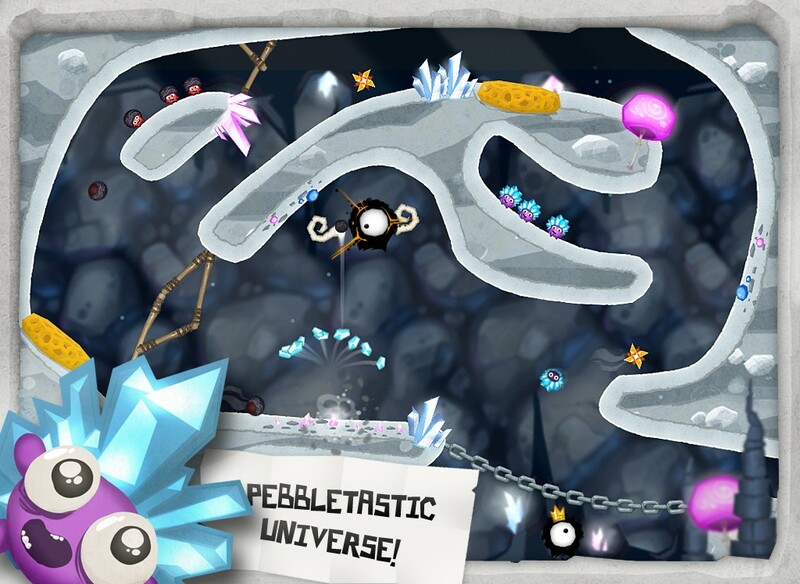 The game takes a number of queues from Angry Birds, with lines of varied pebbles placed at one or more locations throughout the level. By tapping on the first pebble in one or more of these lines you start the pebble(s) rolling. There is no way for the user to impart any sort of varied pressure at launch to make the pebble roll faster, it’s just a simple tap to get the ball…err pebble rolling sort of thing. You must also figure out which types of pebbles are best to use on which monsters, and which order you’ll need to do so, to avoid taking out the head monsters too early, ending the level prematurely. Sometimes there are additional obstacles like bouncy sponge-like platforms or manual/automatic fans which can be triggered to help guide the pebbles down a particular path to ensure a collision occurs near one of the baddies. Like Angry Birds, you can only fire off the varied pebble types in a pre-defined order, with any unused pebbles earning bonus points after completion of the level. Pebble Universe is a fine new addition to iOS’ ever-expanding catalog of physics-based puzzle games, and worthy of your attention. I found the game to be a bit addictive and that once I started playing I couldn’t stop, completing the full set of 55 levels in just a couple of hours. However the app ensures players that additional levels are on the way. With really cute graphics and a responsive physics engine, Pebble Universe is sure to be a crowd-pleaser for fans of the genre. You can (and should) pick up this universal app for just 99¢.